Elements Applied: Seeds and flowering tops are commonly applied in herbal medicine. Quinolizidine alkaloids; isosparteine, dihydro-lupanine, sparteine, N-methylangustifoline, lupanine, ammodendrine, l3-hydroxy-lupanine, and different derivates. Other; p-coumaric and caffeic acids, pigments, and tannins. Lectins can be found in plant seeds. Used for: The remedy is applied due to its potency to treat cardiovascular conditions, especially those linked with low blood pressure, heal inflammations, sores, diarrhea, and shrink the vessels. Broom is highly beneficial for decreased heart tone and low arterial tension. Due to the fact it also boosts urination, and shrinks the vessels walls, strengthening every myocardium contraction, it may be successfully applied in case of liquid accumulation in the organism, associated with heart’s low tone. Broom is applied to reduce excessive menstrual bleeding. According to Kloss description in his books, broom acts as follows: it is highly beneficial for treating bladder and kidney conditions, particularly, bladder stones. Taken in combination with uva ursi, dandelion, and cleavers, the herb is known to produce a purifying effect on bladder and kidneys, boosting urination process. Dropsy associated with heart weakness is also cured with the aid of broom extract. Used as an ointment for vermin and lice. Additional Info: Broom can be found in Great Britain and Europe. It is specially raised in South Africa, several areas of Asia, and North America. Preparation and Intake: To make an infusion take 1 teaspoon of herb extract (dry) and fill it up with a glass of boiling water. Let it stay for 15 minutes. The result should be used thrice a day. In form of tincture the herb is applied in a quantity of 1-2 ml thrice a day. 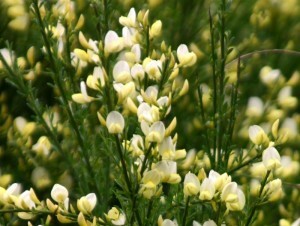 Commonly mixed with: To apply in heart conditions broom is commonly mixed with Hawthorn Berries or Lily of the valley. Safety: Warning! Broom overdose may lead to blurred eyesight, increased perspiration, and vomiting. Broom should be avoided in case of pregnancy or elevated blood pressure. Broom is rich in hydroxytyratime and alkaloids, due to which fact it should be used under medical control only.